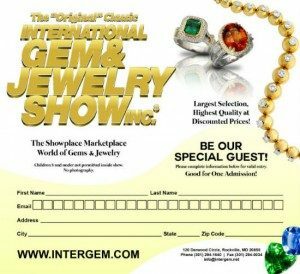 Our 1st show of the year will be the Dallas Intergem show at Market Hall, Jan. 11-13. We will be in the smaller North Hall on the Northeast side with the entrance on Market Center Blvd. The most convenient parking will be directly across the street from the show entrance at the Market Center parking lot and garage. You will find us in booth 410. We will have lots of new pieces we’ve been busy putting together and it will be a good chance to welcome in the New Year. Hope to see you there! Show hours are the same as usual. Friday: noon – 6pm, Saturday: 10am – 6pm, and Sunday: 11am – 5pm. You can download the ticket image below for free entry into the show.